Biteam's 3D woven beam-like profiled preforms are carbon textile reinforcements engineered for strengthening composite materials required for use as primary load-bearing structural members, jointing modules and stiffener elements. They have fully integrated 3D network architecture through use of three sets of yarns that are arranged in mutually perpendicular XYZ orientations and in a desired cross-section profile. Such a structural integrity makes Biteam’s 3D woven profiled materials highly delamination resistant and reliable single-piece preforms. These 3D woven beam-like profiled materials are advanced preforms and sought for being used as structural members, stiffeners and jointing modules in crucial aeronautical/aerospace, automotive, marine, building/construction applications. They have also found use in certain medical products. Thanks to Dual-Directional Shedding and Multiple Weft Insertion Systems, Biteam's 3D woven profiled fabric has significantly low crimp. This is because the warps do not traverse between opposite surfaces but interlace within their assigned planes in columns and rows with the vertical wefts and horizontal wefts. As a consequence, the mechanical performance increases correspondingly. 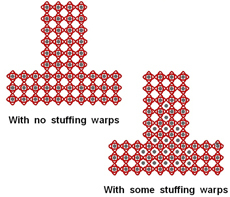 By way of comparison, the conventional 2D-weaving method employs the mono-directional shedding system. This method cannot produce 3D structures and fabric properties similar to that producible by Biteam's proprietary 3D-weaving technology. The mechanical performance of Biteam's 3D woven material stands further enhanced through selection of weave patterns (plain, twill etc.) which can be different between and within the arranged columns and rows of warps. Further, different carbon fibre types can be combined in different directions and sections of the same profile to realise the desired mechanical strength. Whereas profiled materials usually require no extra stuffing warp yarns, additional stuffing warp yarns can be included, if an application demands, to increase the fibre volume fraction, either in all pockets or some select pockets, to achieve the corresponding increase in longitudinal mechanical strength and load-bearing capacity of the profiled materials. 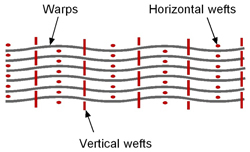 The warps, which are pre-arranged according to the cross-section of the profile to be produced, is interlaced with a number of vertical and horizontal wefts to produce directly the desired profile for the required specific functionality. The profile’s walls can be woven from multiple unified columns/rows of warps (high) to single column/row (low) for engineering the desired load-bearing capacities of the 3D woven profiled materials. 3D-Weaving enables engineering the required dimensional tolerances of the cross-sectional profile directly by using suitable number and count (1k, 3k 12k etc.) of warps and wefts independently. Thus, profiled materials of solid, shell, tubular and combination types can be produced in cross-sectional dimensions according to application needs. 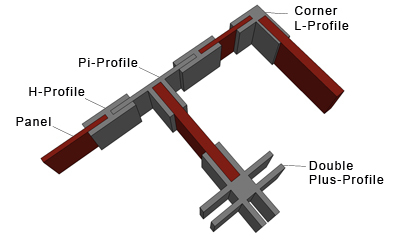 The structure of Biteam's 3D woven beam-like profiled preforms is characteristically different from the laminated, pultruded and braided structures as shown. The most significant difference is that Biteam's structure has fibres directly oriented in fabric's thickness and width directions whereas the other structures have no fibres oriented directly in the stated directions. 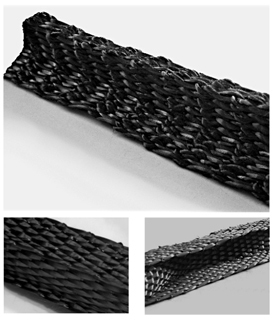 As a consequence, the laminated, pultruded and braided profile structures display correspondingly lower mechanical performance and reliability compared to Biteam's 3D woven profiles. The flexibility of Biteam's 3D-weaving process, which facilitates direct production of a wide range of profiled preforms, makes it possible to readily produce, combine and join suitable different 3D woven profiled preforms according to structural and constructional demands. Such a method of assembling one component to the other in a quick, easy and cost-effective way, called modular construction, is now practicable with composite material beams produced using Biteam’s 3D woven profiled reinforcements. The possibility of combining different 3D woven profiled materials flexibly gives freedom in designing, ease of constructing and reliability in material performance.